First, I want to thank everyone for making last week (the big six month celebration) such a huge success. It was awesome! And this week continues to be fantastic. The Presto Pasta Gang on facebook has 19 members. Please join the fun. We're adding links to our favorite pasta recipe sites. As if we don't have enough pasta dishes here! But then, one can never have enough pasta, right?! 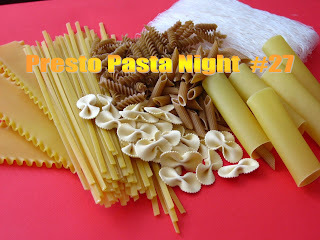 Another first for Presto Pasta Night...our first non-English post. 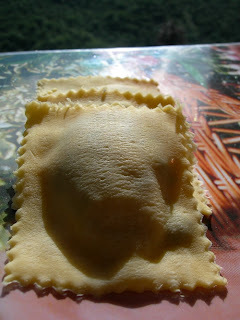 Sab from Le Plaisir de Gourmandise wanted to share his delicious looking Ravioli. I decided to do a very abridged version - just of the recipe - in English on my blog for those of you who would like it translated. I was born and raised in Montreal but haven't lived there (or spoken French much) for 17 years. I thought this would be a fun exercise. Of course any goofs are all mine and if the recipe works for you...that's all due to Sab! 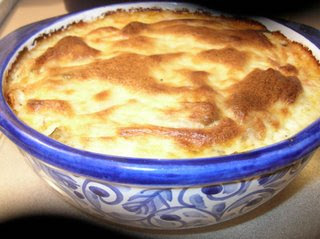 My cousin Arlene is back from Toronto with no blog, but another great recipe. This time it's Orzo Salad with Feta, Cherry Tomatoes & Avocado. We had to test it out, naturally and it was a big hit here. Valerie, over at More than Burnt Toast has great recipe for all those zucchini still sitting in everyone's garden...it's Baked Vegetable Spaghetti hiding under that crust and it looks terrific. Kevin of Closet Cooking shares a really interesting Asian Salad. 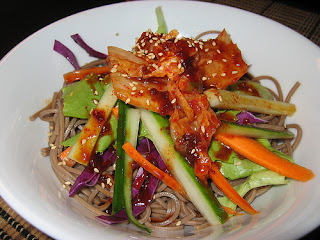 I know my daughter and her husband will particularly love it...Soba & Kimchi are two of their favorite ingredients. 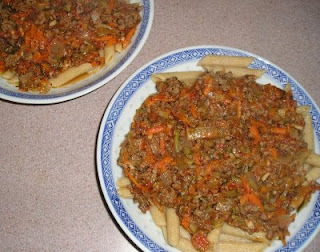 Tigerfish of Teczcape shares one of her favorite dishes with us. 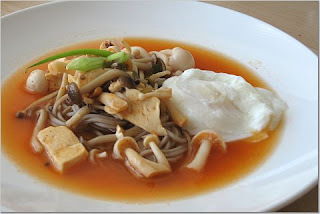 This Soba & Mushroom Medley in a Spicy Korean Broth will have to be bookmarked for our very blustery Nova Scotia fall and winter. I use the same book Jewish Cooking in America by Joan Nathan - I love it! 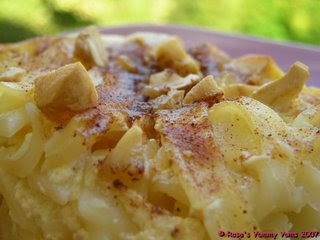 - but I've only tried this one - North Shore Chicago Hadassah's Lick-Your-Fingers Kugel . If you squint you can see it in the middle of last year's Rosh Hashonah dinner. 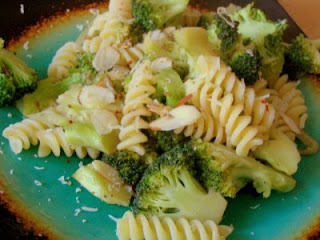 Marta the amazing Italian in the US brings a great Piemontese Pasta with Broccoli. Looks wonderful, doesn't it? And once again, a stunning dish from Haalo of Cook (Almost) Anything. This time it's Orecchieti Romanesco, Potato & Basil...and I have no words, except...I want some! Sherra of Our Taste for Life couldn't make it to last week's party, but she's here tonight with a delicious dish of Beef & Vegetable Hofan. 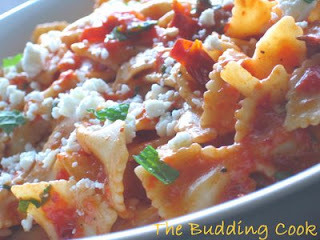 TBC, the Budding Cook has this excellent comfort food kind of dish I love...Pasta with Roasted Peppers , Tomatoes and Feta. Delish! Give me a bowl of this to chow down when the rain comes later today. 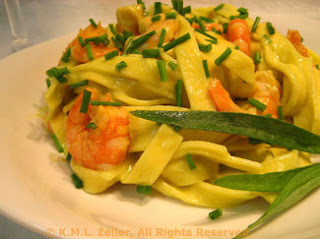 Katie of Thyme for Cooking has a hysterical post...no comments to give it away, but I will tell you she shares an awesome looking Shrimp & Avocado Pasta. Mansi of Fun & Food just found out about Presto Pasta Night and quickly put together this luscious Vegetarian Pad Thai. Now I just have to find tamarind here in Halifax! 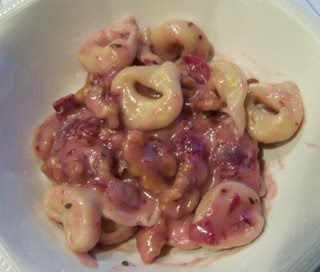 Zoey53 of Recipes on the Fly is back with this intriguing dish of Tortellini with Cranberries & Walnuts. I don't know about you, but I'm rushing out to find some cranberries. I wonder what the deal is here in Nova Scotia for fresh local cranberries? Do you think there are farms that we can pick our own? Hmmm a little research is in order. Ferdzy of Seasonal Ontario is back with a wonderful walk down memory lane (at least for me). 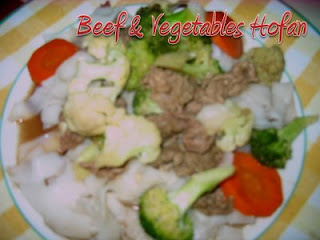 She shares a healthier version of the "Spugeddi" that reminded me of my own story...what's yours? 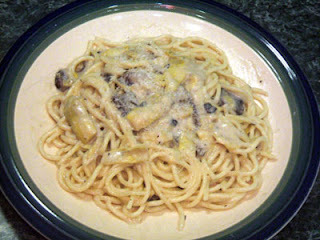 Mike at Mel's Diner joins the PPN fun for the first (of many, I hope) time with a delicious sounding dish of Pasta with Mushrooms & Artichokes. I'm drooling! The wonderful Sher of What Did You Eat? 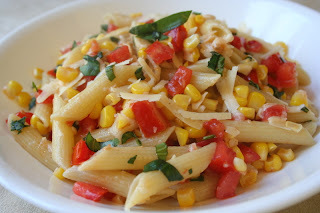 is back with a great dish for a heat wave - Pasta Salad with Fresh Corn & Tomatoes. It's just what we need, especiallly with local corn so plentiful! 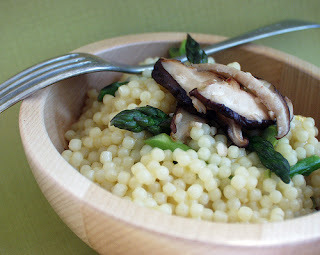 Dayna, the fantastic Vegan Visitor is back with a perfect alternative for risotto...Peperiti Risotto with Asparagus & Shitake Mushrooms. I don't know about you...but I'm heading out to find some peperiti. 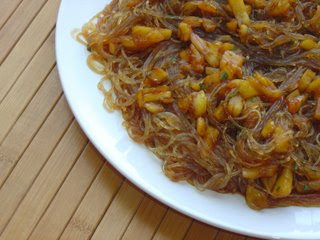 Sara of I Like to Cook has a very interesting dish of Cellophane Noodles with Pineapple & Basil. And you HAVE to click through to her post on "bad food". It's hysterical. Ulrike of Kuchenlatein is back. Her new KitchenAid Pasta Making Attachments arrived and I'm jealous. No picture here of her Homemade Pasta because she's got a great "how to" slide show on her post. Check it out! Somehow, although Poonam of Cooking Adventures was the first to send in this week, I just found her entry with a big star beside it in my emails. How could I have missed it?! I apologize a thousand times. 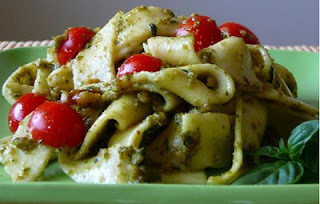 It's a lovely Basil & Tomato Pasta and one of my favorite combos. And last, but not least..it was delicious our very own (Joanna and me) non-traditional, made from scratch Spicy Olive & Sun Dried Tomato Lasagna. We were very proud of ourselves. Don't forget to join in the fun for next week and don't forget to visit the Presto Pasta Gang on Facebook. And, most important of all... a very big thank you to all of you for playing along and visiting every week!!! Wonderful looking pastas. There is such variety out there I don't know where to start! You mentioned carnberries - I can't get them although they have a tiny little red berry here that everyone assures me is a cranberry... looks more like a red current to me... If you find a source to harvest your own I'll be so jealous! Thanks for doing this, Ruth. Another great line-up Ruth. What inventive recipes by one and all as always. A great outlet for all those wonderful pasta dishes!!!!! Hey Ruth that's a beautiful roundup. Just wanted to let you know, I can't find my Farfalle with Lima beans here? Everyone, thanks! It's always a treat to find exciting new recipes week after week. So keep them coming! Katiez..I did find a place to pick your own cranberries. Hopefully we'll get to try that this year. They open in October. 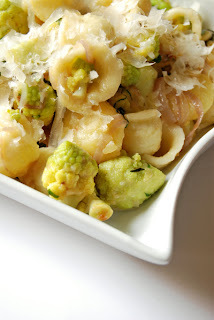 Madhuli, I do apologize for not adding the farfalle and lima beans this week. I don't know what happened, but it will be up again -first, actually in next week's roundup.